Enter your email address below to receive a notification when Flaming Licks starts accepting new sign-ups! Enter your email address below to receive a notification when Flaming Licks is accepting new sign-ups again. Your first box will be shipped immediately after your order is placed by default. Alternatively you can choose the desired shipping date during sign-up. Any further boxes will ship at the end of each month. 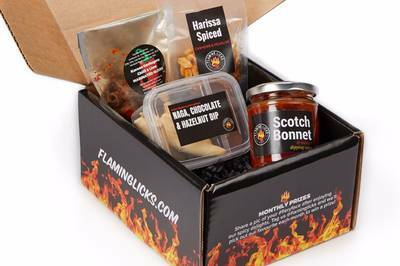 Flaming Licks is the ultimate club for hot sauce heads and spicy food lovers. 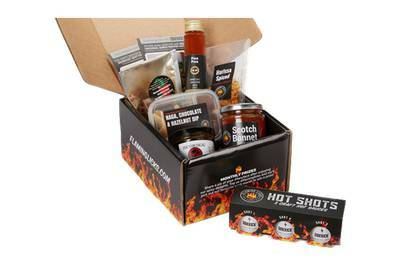 Each month, subscribers receive craft hot sauces and spicy food items from British producers. None of the items we deliver can be found on the high street and are often limited edition. 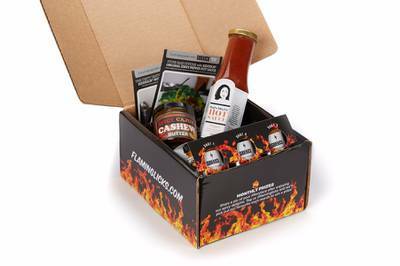 Subscribe to our Hot Sauce Box today, international shipping is now only £5/box! Our Hot Sauce Box contains 1 hot sauce of the month, a 2nd hot sauce or spicy condiment and a couple of other spicy products such as snacks, confectionery, spice rubs or cooking products. Love the selection this box comes with, totaly worth it, highly recommend!